Tracking your expenses is one of the most important things to become successful. But sometimes it’s really hard to track all of them. Whenever we spend our money somewhere we forget it after a few days. And then, end of the month we are totally blank about our spending. As an Excel user, you spend you most of the time working on Excel. So it’s better to have an expense tracker template in Excel so that’s we can access it in a few clicks. And here I have 1-page expense tracker for you. The best part is this template is specifically for those people whose want to track their expenses but always find hard to track. As I told you, this is a one-page template, but it’s quite powerful to track your expenses. Follow me to explore its features. Here in this template, you can enter a monthly budget to use as a benchmark for your monthly expenses. This section will show you about the current month’s budget you have and along with that, it will show you the increment in current month’s budget from last month’s budget. This section will give you a snapshot of the total amount spent on expenses in the current month. The amount will update instantly after you enter a new expense entry. And below it, there is also a small message about the percentage of budget you have consumed. If you have faces some unplanned expenses sometimes, you can track those expenses in this template. In this section, you’ll get a quick view about the percentage of unplanned expenses from your total expenses. And also a small message for the amount of unplanned expenses. Yes, you can track your expenses in categories also. This section will show you category wise summary of percentage share. Here you can check your day wise expense amount. It will show you your day wise spending on your expenses. This will help you to track that how often you spend in a month. Please follow me to learn how to use this template to track your expenses with not efforts. It’s super easy to enter an expense. Here are the steps. From your main template sheet, click on the “Data” button. It will navigate you to data entry sheet. Now, enter the following things in data sheet. Once you entered your expense data, click on “Template” button to go back to your main template. This template is super easy to manage. When you enter an expense, your template will update automatically. Let’s say if you want to check insights about any previous month you can use drop down list form the main template section to select previous months and years. If you have a monthly target for your expenses, you can enter that target in your sheet. Use below table to add your monthly target. I have used some common expense categories in this expense template. And if you want to add any new category, update it in the category table. Once you add your new category in the table it will automatically update into the drop down list in data entry sheet and category chart. Just like expense categories, you can update a new payment mode in the following table. Once you add your new payment in the table it will automatically update into the drop down list in date entry sheet. Use “Setting” button from your main template to navigate to above-mentioned tables. ...without any further ado, I want you to grab this template from here. This 1-page expense tracker is a useful tool if you want to track your expense. It will not only help you to track but also give you some useful insights. And the best part is, you can check everything you have spent in past months and on your spending on daily basis. I hope this template will help you to get better in your finance, but now, tell me one thing. Do we have any other thing which we can include in this template to improve it? Make sure to share your views with me in the comment section, I'd love to hear from you. And please, don’t forget to share this template with your friends, I am sure they will appreciate it. If all of the manual entries can be blocked together, downloads from banks and cc companies can be formatted and pasted in, avoiding manual entry and possibly error. how do we change the year? or add a new one, like from 2016 to 2019, 2017 to 2020 or add new ones after 2018 like 2019, 2020..?? Beautiful Work, shrunk to a single page is really worth it. When i try to change the year and month, i get an error. Drop down list only available till 2018. Can we change it? Great design! I would add a table of monthly expenses and create a calendar page showing how much is owed on what day. i have just one problem: when i put the Date, it appears automaticallly wrote in my Language changing all the formulas and i can t modify the “A5” setting… how could i do?? Anyone else having a problem downloading this expense template? 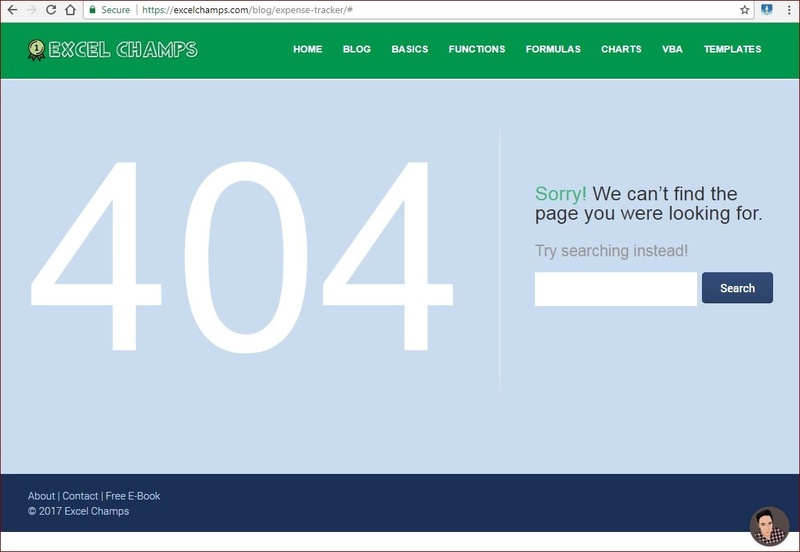 Still getting not found 404 error page… Please advise. Check your email. Sent you a new one. Wonderful! Got it just now! Thank you so so much!!! Got it! Thank you so very much! Love it!